NASA has a few things planned for President Obama's inauguration this weekend. 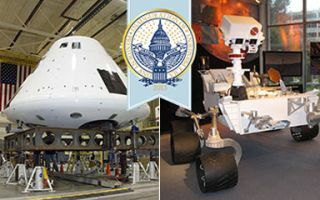 The highlights will include Bobak "Mohawk Guy" Ferdowsi marching with other NASA scientists alongside full-scale models of the Mars Curiosity Rover and the Orion Space Capsule, a "star party" at the Arlington Planetarium in Arlington, V.A., and an open house at NASA headquarters. Panel discussions: 10 a.m. to noon, 2-4 p.m. in the James Webb Auditorium. Panelists include NASA astronauts and senior leaders. Topics: The future of human spaceflight, technology innovation, science on the International Space Station, ongoing and future missions to Mars, a demonstration of NASA's robotic exoskeleton. A NASA Social for our followers on Twitter, Facebook and Google+. NASA exhibit between 14th St. and 12th St. underpass (Education Section). Meet astronauts, learn how to engage directly with NASA. Planetarium shows with limited, reserved seating. Full-size models of the Curiosity Mars rover and Orion, the multi-purpose capsule that will take our astronauts farther into space than ever. Current and former astronauts: Alvin Drew, Serena Aunon, Kate Rubins, Mike Massimino, Lee Morin and Kjell Lindgren, as well as Leland Melvin, NASA's associate administrator for Education, and John Grunsfeld, NASA's associate administrator for Science.